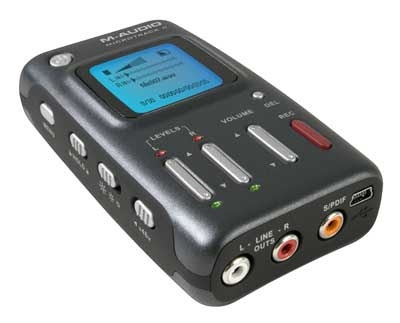 The M-Audio MicroTrack isn’t necessarily the highest quality portable digital audio recorder around. It lacks built in mics, and the built-in battery isn’t removable. But the MicroTrack II does have a few things going for it. It provides 48V phantom power for powered mics. It may not have XLR inputs, but it does have quarter inch inputs which are sturdier than the 1/8th inch jacks found on many recorders. And now the recorder is one of the cheapest WAV/MP3 recorders around, with prices as low as $163.99 on Amazon . That makes it a pretty good value for reporters, musicians, and others on a budget. The recorder has a list price of $299, but now that it’s selling for under $200, it’s cheaper than pretty much every comparable recorder with the exception of the Samson Zoom H2, which you can pick up for $157.25 .